KAMPALA– Aptitude tests for thousands of applicants shortlisted for various positions at Parliament has failed to take off at Makerere University as scheduled after a major technical glitch affected computers. 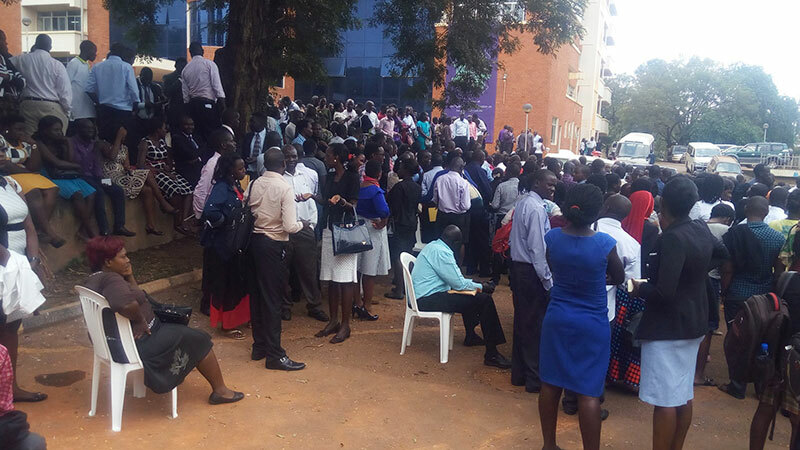 Parliamentary Commission was due to start the interviews at Makerere University College of ICT on Thursday but the batch of thousands that was scheduled to do the tests was left idle in the campus. The university has reportedly asked Parliament to consider rescheduling the tests that were meant to be done Thursday and Friday to next week. Though close to 10 000 people applied for the jobs the Parliamentary Commission shortlisted 4,200 who met the qualifications, which vary with the positions. The minimum for all was a university degree. Among the positions being competed for are research and publication officer, clerk, engineering officer, assistant editor of the Hansard, procurement officers, information officer and protocol officer. Sources at Makerere University say computers servers broke down in the morning and attempts to restore them were fruitless. Hordes of the applicants were seen hanging around the university waiting to be informed of the next move. The Parliamentary Commission was yet to communicate whether it has cancelled even the tests scheduled for tomorrow as efforts were being made to restore the servers.